Police recovered the handcuffed dead body of a BNP leader from Kushtia on Saturday night, around three hours after he was allegedly picked up by Rab members from Jhenidah. Rab denies as usual. By Bangladesh Media; Police recovered the handcuffed body of a BNP leader from Kushtia on Saturday night, around three hours after he was allegedly picked up by Rab members from Jhenidah. The dead, Rafiqul Islam Mazumdar, was the general secretary of BNP's ward-56 unit of Dhaka City Corporation, reports our Kushtia correspondent. He was also vice-president of Bangabazar Super Market in Dhaka and a resident of Shanir Akhara in the capital. “The handcuff read "police". 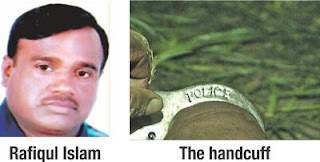 But we are not sure what actually happened as this type of handcuff is available in the market,” said Zoynul Abedin, additional superintendent of police in Kushtia. “He [the victim] might have been killed over past enmity in the capital,” added Zoynul. Earlier on June 25, 2010, president of ward-56 BNP Chowdhury Alam disappeared never to be seen again in public. Rafiqul, 39, went to Savar from his Shanir Akhara house on Friday morning from where he went to his in-law's house at Anandanagar village in Shailkupa upazila of Jhenidah, family sources said. His mother-in-law Lipi Khatun said, "Seven people came to our house on a microbus around 7:30pm on Saturday and introduced themselves as members of Rapid Action Battalion." “They were all armed and wearing Rab uniforms,” Lipi said, adding that they handcuffed Rafiqul and went away within 15 minutes. “They asked us to contact with Rab-6 office in Jhenidah,” said Abu Sayeed, brother-in-law of Rafiqul, adding that the microbus that carried the seven-member group had a sticker of Rab-6 pasted on it. “We contacted the Rab-6 office in the evening repeatedly, but Rab officials told us that they were not aware of the incident,” Abu Sayeed added. Informed by the family members, a team of Jhenidah Sadar Police Station led by Officer-in-charge Abdul Bari visited Rafiqul's in-law's house around 9:30pm. “We asked them [family member] to lodge a GD [general diary] in this connection but they did not do so,” the OC told The Daily Star yesterday. Later around 11:00pm, police recovered the body from Adabaria-Monohordia field in Kumarkhali upazila of Kushtia, 20 kilometres off the in-law's house, said Ali Newaz, OC of Kumarkhali Police Station. “Rafiqul was strangled by his muffler and his face and head bore a few injury marks,” Ali added. Contacted, Hamidul Haq, squadron leader and also camp in-charge of Rab-6, said: "Rafiqul's in-laws contacted with us in the evening [of Saturday] but we confirmed them that Rab-6 did not pick Rafiqul up." Forced disappearances and subsequent recovery of bodies have seen an alarming rise in the last four years. Between 2009 and 2012, at least 156 people were the victim of forced disappearance, Sultana Kamal, executive director of rights body Ain o Salish Kendra, said in November last year. In many cases, family members of the victims hold members of law enforcers responsible for such disappearances and deaths, although law enforcement agencies dismiss the allegations.